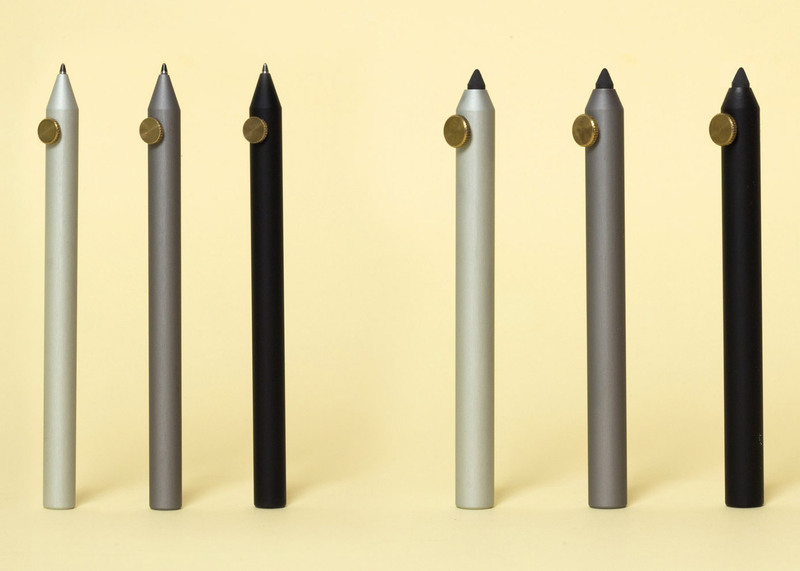 With Apple trying to convert creatives to its digital pencil, Italian designer Giulio Iacchetti is hoping to prove there's life yet in graphite with these mechanical writing tools. The pens and pencils are described by Iacchetti's self-launched design brand Internoitaliano as "an exercise in absolute minimalism for design junkies and aficionados of writing". Each one is made from a rod of solid aluminium which has been anodised and sand blasted. The traditional mechanism for extruding pencil lead or pushing up a nib has been replaced with a single dial positioned on the grip of the pen. According to the brand, this is a reference to the technique used when adjusting compasses for technical drawings. By turning this dial users can regulate the length of the pencil lead, or click the pen nib in and out. The implements come in three finishes: silver, grey and black. "Always a passion of mine, I feel pens and mechanical pencils epitomise objects that can fully express the essence of design: sophistication, simplicity, the archetype of a technical tool, a prothesis of the hand and mind," said Iacchetti, who launched Internoitaliano in 2012. "Having your own pen and pencil with you is a statement of intent: the will and ability to leave a tangible written sign, to begin a story or sketch out a new project," he added. British design brand Minimalux created an equally minimal set of pens, albeit in a range of precious-metal finishes. However while Iacchetti is keen to prove there's still life in graphite, Apple is equally keen to convert people to its digital Apple Pencil which launched earlier this year. In a recent interview with The Telegraph Jonathan Ive suggested that Apple's design team was gradually moving away from pen and paper in favour of the Apple Pencil.